I'm betting that if you didn't connect the dots the moment you saw the word Milos, you're still trying to figure out where you've heard this word before now. 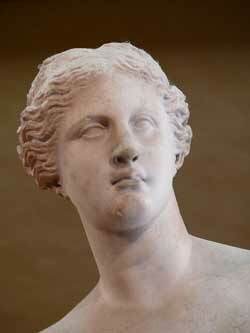 Well, let me help you: "Venus de Milo". Yep, Milos is the island where this beautiful sculpture was found. 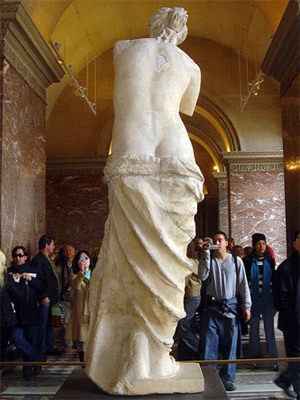 Unfortunately, Venus de Milo is not in Milos anymore, it's in Paris. But, while you won't find it there, you'll find lots of other things that will excite you. Is 'southwesternmost' a word? I didn't think so, until I read it in a book that was referring to Milos. See, Milos is the southwesternmost island of the Cyclades, among other things. What are those other things? Let's see. Volcanic, breathtaking and a geologist's paradise. I used to hear a lot of great things like these about Milos from people who had been there when I was in high-school but for some reason I never visited it. That was until my older brother got a job for the summer. That was about 19 years ago. Now back then, my brother and I didn't have the best of relationships so I was kind of surprised and a bit hesitant when he called me to his place for a couple of weeks. Since he was working all day though, I took my friend Chris and we went there. That's when I realized how true all those things I'd heard were. You see, words can only describe so much. Sometimes you just have to see in order to believe and understand. Milos' beauty cannot be described, so you can see how difficult this task is for me, trying to do so. Now, before I start, one thing: if you like swimming, I mean if the main thing you're going to do in your holiday is visit beaches and swim or sunbathe or stuff, don't bother reading the rest of this. Just go book already! Milos has the best beaches in Greece and, may I exaggerate, perhaps the whole world. 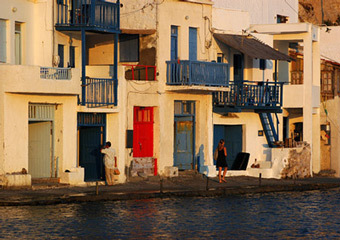 If you search for accommodation in Milos I recommend you to visit Milos Hotel Online Bookings. There, you can make your reservations directly to the hotels and find rooms in low prices and useful guest reviews. So, what does Milos look like? At this point, I'm going to do what most guidebooks do. I'm going to tiptoe around a specific description and just use general words that will have your attention. No, I'm not trying to trick you. If I was, do you think I would be telling you this? It's just that no description will do Milos justice. So, these words will give you an idea of what Milos is about and then you'll look at the pictures and see for yourself. So, Milos is a mix of extraordinary rock formations, hot springs, white villages perched on multicolored cliffs, churches and white cube houses, volcanic relics and stretches of beach. There. That's Milos. That's what it looks like, that's what you will find there. So, why should you visit it? Well, because, as I said, no description can do it justice. Isn't that enough? OK, if you want more, just keep reading. I'm sure you will find that Milos is an exciting island once I get into details, which is going to happen. now. 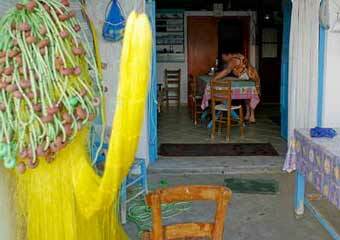 What places should I not miss in Milos? Well, let's start with the museums. Milos has at least four museums, but I'm going to recommend three of them: the Archaeological Museum, the Mining Museum and the Folklore Museum. The archaeological museum is housed in a neoclassical building of 1870 in Plaka, right next to the bus stop. Its entrance hall is dominated by a plaster copy of Venus de Milo, one of the most significant exhibits of the museum, along with the Lady of Filakopi, a clay figurine representing a female divinity. The museum includes remarkable pieces dating from the Neolithic and Mycenaean periods. The Mining Museum in Adamas, on the other hand, is an inspired display of all the minerals, rocks, ores and other materials that were concealed in the Volcanic interior of Milos. As for the Folklore Museum, it contains items of popular art reflecting the traditions of the island. It's housed in a 19th-century mansion, next to the church of Panagia Korfiatissa. Speaking of churches, two of them are definitely worth visiting. The fist is the Church of Panagia Schiniotissa (Our Lady of the Bushes). The church was formerly known as Mesa Panagia. Then when it was bombed during World War II and rebuilt, it was renamed after an icon of the Virgin Mary appeared in a bush where the church used to stand. As for the other one, it's the Church of Panagia Thalassitra (Our Lady of the Sea), built in 1728. This church contains some beautiful icons of Christ, the Virgin Mary and Agios Eleftherios. As for monasteries, I'm going to suggest the famous Monastery of Agios Ioannis Theologos Siderianos that holds a beautiful legend/story. Once during the Saint's festival, the revelers were attacked by pirates and took refuge in the church. In response to their prayers, the saint turned the church door to iron (you can still see a scrap of a dress caught in the door as the last woman entered), thus preventing the pirates from breaking in. When one tried to open a hole in the dome, the Saint made his hand wither and fall off. 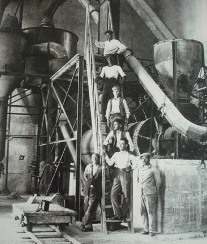 Thanks to this story, the Saint got his nickname: Siderianos (Iron Saint). Now churches and museums aside, there are a couple of other, unique places that you should not miss. One of them is Papafrankas Cave. Don't be fooled by its somewhat weird name: its steps will take you down for an atmospheric swim in a pool connected to the sea by an inlet running under a rock bridge. How about that? Doesn't it sound exciting? Well, just wait till you see it! Then, there's the magnificent natural site of Sarakiniko, an amazing landscape carved by the wind and lapped by a deep blue sea. You can take a dip there as well, but be careful as you come out of the sea because the waves can throw you against the rocks. Finally, don't forget to pay a visit to the beautiful and picturesque village of Trypiti. This place that owes its name to its soft ground that looks pierced (=trypiti) because of the volcanic rocks it contains, offers graphic mills, the temple of Saint Nicholas, the Catacombs and the Ancient Theatre just nearby and a remarkable view over the sea. Well, when thinking about Milos, naturally the first archaeological. thing that comes to mind is Venus de Milo. The Aphrodite of Milos was unearthed by a farmer in 1820 near the theatre in Vale of Klima (that, don't worry, I'm going to refer to next). 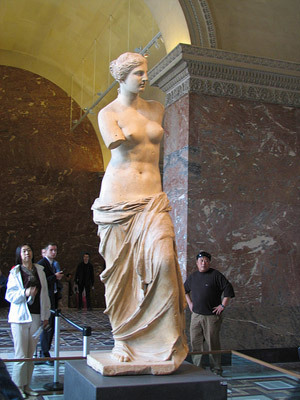 Unfortunately, the French took Venus de Milo, never to return, and you can only see a replica of it. If you want to see the original, you're going to have to go to the Louvre in Paris. The only sign of the statue's presence here, besides the replica, is a track from the Catacombs that leads to the place where it was discovered, now marked by a plaque. So, Vale of Klima: on the seaside slope where the Miliots built their city, excavations in the late 1800s uncovered a Dionysian altar and the remains of an ancient gymnasium, along with a Roman mosaic. All of these are quite well preserved. Just three paragraphs above, I mentioned the Catacombs and the Ancient Theatre in the village of Trypiti. The Catacombs are Christian; actually, they're the earliest evidence of Christian worship in the whole country. Two hundred ninety one tombs that held a number of bodies; all of them have been robbed but the site still remains moving. Only the initial 50 metres are open to the public. 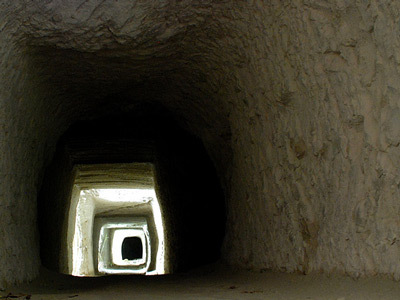 To learn more about the history of the catacombs and what to expect when you visit them take a look at my page Milos Catacombs. OK, this section is a bit confusing.The path that I mentioned above? Well, not only does it lead to the plaque, but it continues past the ancient Cyclopean city walls to the well-preserved Roman theatre, where spectators looked out over the sea, reconstructed to at least resemble what it once was. A company from Athens sometimes performs in the theatre in August. Finally, there's the Kastro, built by the Venetians on a volcanic plug 280m above sea level, but unfortunately only the houses that formed the outer walls of the fort still remain. 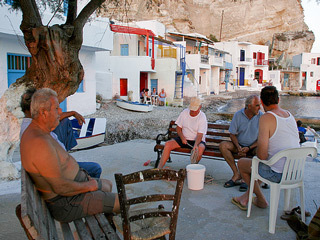 Are there any traditional villages in Milos? Of course there are! This was a rhetorical question. There is Plaka, the capital of the island, Klima, Tripiti and Fourkovouni all characterized as traditional by the Greek Ministry of Tourism and some more that I liked a lot, Mantrakia, Fyropotamos and Areti. To read some of my comments regarding the specific locations visit my page Traditional Villages. 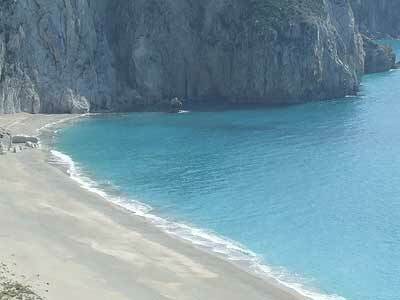 What about the beaches of Milos? Remember what I said above? Well, let me rephrase it: if there was an illustrated dictionary with the term "beautiful beach", it would have a picture of Milos underneath. Simple as that. What can one (that one being me) say about the beaches of Milos? Well, many things, actually. Many adjectives or phrases, one after the other: countless, well-sheltered, unique, colorful, with amazing rock formations, with crystal-clear waters, sandy... But those don't mean much now, do they? Visit my page Milos Beaches to learn more about the things that mean a lot. Well, since my brother used to work there and I know first-hand how great it is, I'm going to start with Aragosta. It's a bit pricey, I'm not going to lie. But it's simply amazing, an excellent Italian restaurant with tasty dishes such as duck, lobster and pasta, a delicious dessert. Other than that, I only tried a couple of restaurants for the sake of variety, against my brother's wishes. 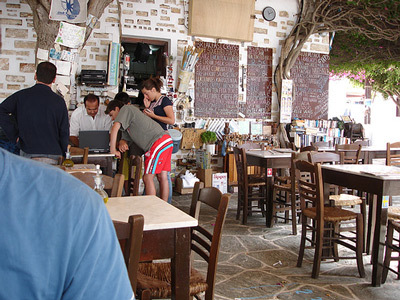 One of the best is Flisvos, a tavern that serves the best fish and a delicious cheese pie, among other (Greek) dishes. Navayio is quite good and popular too, a favorite with locals. It has fresh fish and delicious mezedes. Astakos to the west of Adamas at the end of Langada beach is another lovely restaurant with quite friendly service. The setting is beautiful and the dishes are quite good, with generous portions. Finally, Methismeni Politia, near the catacombs, is yet another amazing restaurant. The meals are served on the terrace which is large and secluded. The menu offers various dishes of the day and a variety of original salads. 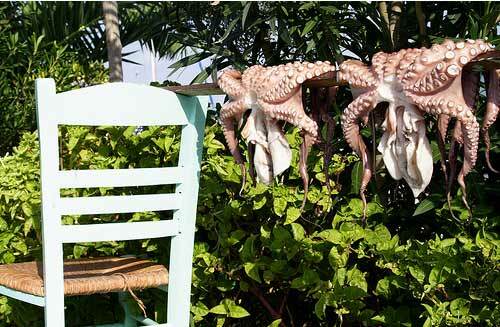 Definitely try the shrimp souvlaki and the octopus in red sauce. Sophisticated - that's the word the guidebook I'd bought uses to describe Milos' nightlife. So, that's the word I'm going to use as well. Sophisticated. Amazing. Wild. Because places like "Viagra" can keep you up all night (and don't laugh, that wasn't a hint). Puerto is a lovely place with Greek music; Fuego, Plori, La Note, Feggera, all of them are in Adamas, all of them are the hot spots of the town; Yanko's is a local hang-out; To Ouzerie and To Kafeneio, another two lovely places. How do I get to Milos? From the airport of Eleftherios Venizelos in Athens there are daily flights to Milos. The airport of Milos is 4,5km from Adamas. For more information on the time schedules and flights visit the site of the Olympic airlines. By ferry, the trip from Piraeus lasts about 5 hours without stops and about 7 hours when It reaches the ports of other islands. There are also high-speed boats who sail to Milos on a daily basis. For information call the port police of Piraeus (+30) 210 4226000 or the port police of Milos (+30) 22870 23360.